Enjoy life in the Hamptons at the best time of the year ! This summer vacation home lies in the heart of Southampton village yet it is very quiet and private. It’s central location allows you to walk to Main Street with all the shops & restaurants or bicycle to private village beaches within 15 mins. The village train station is in walking distance as well. The well maintained 2 BR / 1 bath offers modern amenities including central air & heat, high speed internet , wifi, cable, Apple tv , plus 42” flat screen tv . The eat in kitchen with a dining table for 6 people and a breakfast island includes a 4 burner gas stove with convection oven, microwave , Bosh dishwasher and is fully stocked with essential kitchen equipment . House sleeps up to 6 people. The MBR as well as guest bedroom have a queen size bed. One of the sofas in living room is a sleeper sofa with a comfortable pull out matress . Wooden flooring throughout the house. Washer & dryer on site. A big terrace door leads to the outdoors. The brick patio , with five burner gas grill , dining table and casual seating for up to eight people invites to entertaining outdoors or to simply relax at home, surrounded by beautiful gardens. A bbq grill station with a 5 burner gas grill completes this area. You can spend the entire day out there; lounging, relaxing, and entertaining. And there is always plenty of sunshine on the patio & in the garden from sunrise to sunset! The pool area is an oasis of serenity , surrounded by nature. A heated pool with a brick patio all around and 6 reclining chaise lounge chairs awaiting you. 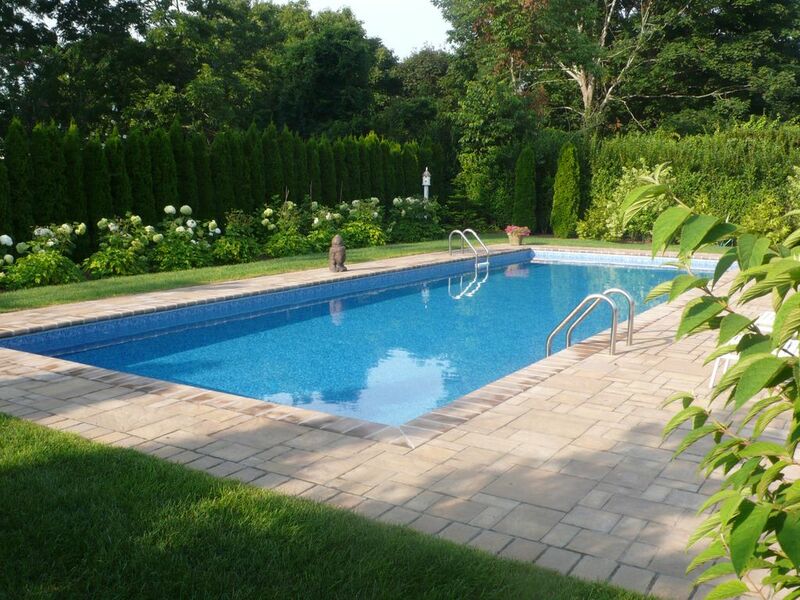 Enjoy a swim in the 44 x16ft saltwater pool or simply sunbath and relax in this private oasis. An outdoor shower w/ changing cabana comes in handy when returning from the beach or after a swim in your pool. A glass of wine at the end of day, sitting in the garden & watching the star studded skies .... it will be one of your memorable moments for sure. If you are looking for a quiet but central place , with modern amenities and private outdoor oasis, then this place is for you. The property is available for rent for the month of July or for the month of August to Labor Day this summer. For additional questions or to schedule a viewing, pls contact the owner. Property located in the heart of the village, in walking distance to shops and restaurants. 2 adult bicycles available. Bike rental shop in village. 14ft x 44ft saline pool, 4.5 ft depth. 6 lounging chairs in pool area. Me and my wife stayed here in August and had a wonderful time. The place was very comfortable & well maintained. Great kitchen for cooking. The pool area was like a private oasis , in the back of the property , surrounded by lush gardens. Very quiet and a perfect place to relax for us. Location is very good as it is close to train station and we could walk into town. 50% payment of rental amount is required at the time of booking. Payment of 50% balance of rental amount plus a 15% security deposit is due one month before rental start date. The 15% security deposit will be a deposit for repairs / replacement in case of damages and/or covering utility & maintenance expenses above $ 1,500.- monthly . Utility & maintenance expenses include electricity, gas, water, cable, internet service, telephone, weekly garden & pool maintenance.